Wyoming used one final turnover to seal a 16-14 victory over Nebraska in an unusual 2018 Nebraska-Wyoming Six-Man Shootout held Saturday at the Boone Central athletic complex in Albion. This was not a typical six-man contest, where combined scores often reach 80 to 100 points each fall. This was a hard-hitting, fiercely-contested defensive battle played on a hot Nebraska afternoon. Wyoming forced turnovers in the game, and needed every one of them to break Nebraska’s three-game winning streak in the series. Nebraska’s highlights also came on the defensive side of the ball. 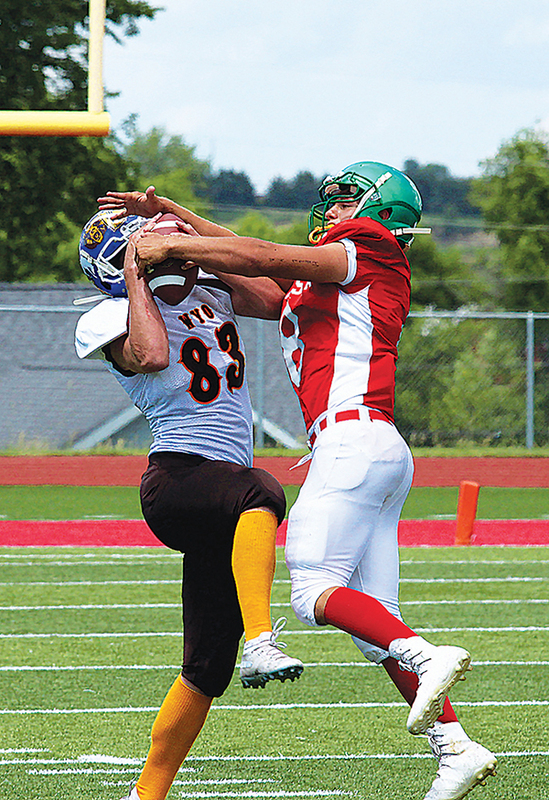 The Big Red All-Stars limited Wyoming to just 153 yards of total offense and three first downs, scoring their second touchdown on a fumble recovery in the end zone. Unfortunately, Nebraska generated only 85 total yards of its own (negative-29 rushing) and could not overcome the myriad turnovers. “When we were down 16-6, we got a defensive touchdown and made our PAT to make it a two-point game,” Nebraska Coach Joe Imus, directing the All-Stars for a fourth consecutive year, commented to reporters. “I thought we had the momentum on our side. We got the ball back – and had another turnover.